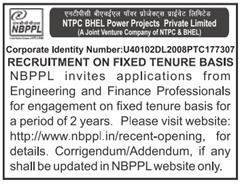 NTPC BHEL Power Projects Private Limited (NBPPL)is going to recruit for the post of Engineering and Finance Professionals for recruitment of various posts on fixed tenure basis for a period of 2 years.The candidate may apply till 12th December 2016. 1. Bachelors degree in Engineering / Technology in MECHANICAL or equivalent disciplines with minimum 60% marks in aggregate of all the years / semesters. 2. Minimum 01 Year experience largely in the following areas: Experience in "Design /Engineering" of Mechanical systems/ equipment's for Bulk material / Coal handling plant / Ash handling plant/ other industrial equipment. 2. Minimum 04 years experience largely in the following areas: Experience in "Design /Engineering" of Mechanical systems/equipment's for Bulk material / Coal handling plant / Ash handling plant/ other industrial equipments. 1. Graduate Degree with pass in the "Final" examination of Institute of Chartered Accountants of India OR Institute of Cost Accountants of India with at least aggregate 50% marks considering all levels / stages. 2. In - Depth knowledge in the area of Accounting and Audit, Financial Management, Direct and Indirect Taxation, Management Accounting, Budgeting, Costing etc. A non - refundable Processing Fee of ₹ 500/- by means of a Bank Demand draft drawn in favour of NBPPL payable at Tirupati. Candidates are advised to write their name, post applied for and mobile No. on the reverse side of the Demand Draft. Eligible candidates apply in the prescribed format. The Duly filled-in and signed application with requisite documents including Demand Draft (DD) enclosed are to be sent by speed post only to: The Additional General Manager (HR), NTPC BHEL Power Projects Private Limited YSR Puram, Mannavaram Village, Sri Kalahasthi Mandal, Chittoor District, Andhra Pradesh-517620 by Speed Post Only. The closing date for receipt of applications is 27/12/2016. Completed application also required upload Online through Official Website.